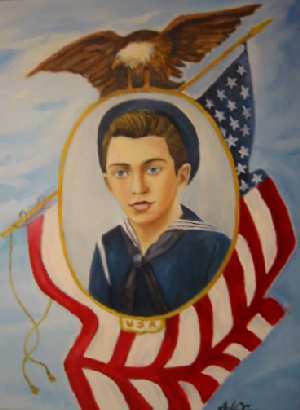 Joe Curgino, a recent 18-year-old high school graduate who had never been outside Chicago, entered the US Navy on April 10, 1944. He took a short train trip with his family from their home in Little Italy, in Chicago's Near West Side, to Great Lakes Naval Training Station, just north of Chicago along Lake Michigan. Although he would be near his home for five short weeks of boot camp, his mother especially worried when her oldest son of a family of two sons and five daughters would leave the country to fight overseas. The war had already brought changes to this close-knit family. The children used to attend Italian language lessons on Saturday afternoon at Mother Cabrini School, where the nuns even taught the singing cheer of "Viva Mussolini!" to the students, but these lessons ended abruptly in December 1941 when Italy declared war against the United States. One morning in May 2006, my wife and I visited Joe Curgino and his wife Rose at their spacious split-level home in Bloomingdale, a northwest suburb of Chicago. Rose also grew up in Little Italy just two blocks from Joe's home. They wrote letters to each other while he served in the Navy, and they married in 1949 after a seven-year courtship. This morning Joe agreed to tell us about his service aboard the destroyer USS Drexler (DD-741), which sank off Okinawa after being struck by two kamikaze planes on May 28, 1945. Joe and about 60 men, who after completing basic training at Great Lakes Naval Training Station, went next to the naval base at Norfolk, Virginia, for training to be part of the crew of a destroyer being built at Bath Iron Works in Maine. He hated cooking duty in the mess hall, but he still did his best for the chief cooks. He marveled at Norfolk's many bright stars, which he had never really seen before due to bright lights in the Chicago area. About 20 crewmen, including Joe, went to Maine in order to pick up their 376 ft. 6 in. destroyer. He marveled at the many women working hard doing welding and riveting of ships at Bath Iron Works. They took the ship to Boston Navy Yard, where the USS Drexler was commissioned on November 14, 1944, with about 350 officers and crew. Drexler went on a shakedown cruise to Bermuda, where Joe for the first time away from home spent a lonely Christmas holiday thinking about family and his mother's delicious Italian cooking. After the destroyer's crew completed a multitude of training exercises, the ship went to Boston and Norfolk for repairs and supplies. Back in Chicago, Joe's concerned family had visited the local Red Cross office to inquire as to why they had not received any letters from him, but eventually letters arrived that he had been doing well. Drexler proceeded without delay to the Pacific battlefront via the Panama Canal, San Diego, San Pedro, and Pearl Harbor. 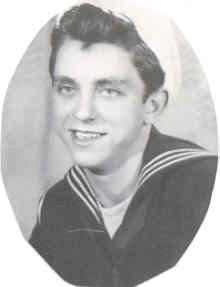 Joe as Seaman First Class was in the gunnery division and he had training and assignments on both 5-inch and 40-mm guns. His final post was at the Mount 42 twin 40-mm guns on the port side. The mount's gun captain coordinated six men to load, point, and fire the guns. He remembered his girlfriend both by the photo he carried and by her name "ROSE" painted on the barrel of his gun. Gunnery Officer Chet Lee, who later went on to become mission director for six Apollo missions including Apollo 13, always kept his division busy with drills since a destroyer's guns needed to shoot at land targets, planes, strayed mines, and other ships. On February 23, 1945, Drexler departed Pearl Harbor for Guadalcanal and then on to Okinawa for the invasion of the Japanese island. Joe was amazed at the huge number of warships, including about 16 to 18 carriers, from horizon to horizon just a day or two before the invasion of Okinawa on April 1. While the land battle raged on the island, Drexler served at several radar picket stations to protect the main fleet from Japanese air attacks and also participated in the occupation of Tori Shima, a small island north of Okinawa. During the early morning on May 28 while Drexler was at Radar Picket Station 15 about 45 miles northwest of Okinawa, Joe heard the warning that the ship's radar had picked up a squadron of eight approaching bogeys (enemy planes). A handful of combat air patrol (CAP) planes went after the Japanese squadron, but the first kamikaze plane came in from the starboard side, crashed into the destroyer at midship near the waterline, and cut off all power. Although Joe on the port side just glimpsed the incoming kamikaze plane, he felt the crash jar the ship and went to manual control on his gun mount since both regular and emergency power had been knocked out. A second kamikaze plane approached a few seconds later, but it was splashed with direct hits from one of the ship's 5-in. guns. A third kamikaze followed closely by a Corsair fighter, passed directly over Drexler, but the smoking plane recovered just over the water and then banked to come in at the destroyer from dead ahead in a shallow glide. The plane passed just over Joe's head and crashed into the port base of the #2 stack. Nobody gave orders to abandon ship, but the men realized that they needed to jump as the ship started rocking strongly after the second kamikaze plane crashed into Drexler. Joe went quickly down a ladder from the gun mount to the lower deck. The ship began listing very fast to its starboard side. Joe quickly began walking toward the keel of the ship until he had to jump off into the water. His life flashed in front of him as the sinking ship's descent pulled him deep into the water. As he broke the surface amidst fire and oil, he looked right and saw the "741" painted on the ship's bow disappear into the water. He then looked left and glimpsed his two Italian buddies Daiuto and Devito for the last time with their arms wrapped around each other. A large life raft floated at some distance from him, so he started swimming under the flames and oil toward it. Although he had no time to put on a life jacket, he made it quickly to the raft since he had always been a good swimmer. He was the second man to reach the raft, and he climbed into it in a daze. The life raft began to be swamped as more men came aboard, so the coxswain tried to calm the panicked men and ordered those men without wounds into the water around the raft, where they held onto the sides or onto a rope attached to the raft. The men floated on their backs to minimize any injuries if Drexler's depth charges or boilers exploded. The coxswain went back to save others in the water, but Joe and the other men clinging to the raft never saw him again. The men around the life raft remained in the water for well over an hour until an LCS (Landing Craft, Support) ship picked them up. When the raft first approached the LCS, it appeared that the ship moved away but this could have been because Japanese planes still remained in the area. The LCS crew threw a rope ladder down the side of the ship. Joe's hands froze on the rope ladder, and a crewmember had to pry his clenched hands from the rope in order to get him onto the deck. The LCS also picked up a few wounded men from the destroyer USS Lowry (DD-770), which had helped Drexler fight off the kamikaze squadron that had attacked the radar picket station. The officers and crew from Lowry lined the decks and saluted the men leaving on the LCS in order to pay their respects. The non-wounded Drexler survivors made their way back on three different ships to Treasure Island in San Francisco Bay. Drexler's Executive Officer talked with some of the crewmembers, including Joe, and asked whether they were ready to go to another ship. Everyone responded "no thanks" in not such polite terms. While serving his tour of duty on Drexler, his weight had dropped to 118 lbs. from his normal weight of 135 lbs. Navy doctors wanted to send him to Warm Springs, Colorado, for rest and recuperation, but he successfully pleaded with them to go back home to Chicago. Reports of the sinking were read back home, but the family was unable to find out what had happened to Joe. He got off the bus at Loomis and Taylor Streets in the heart of Little Italy, and he began walking the short distance to home. 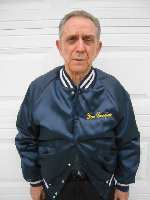 The neighbors recognized Joe and yelled greetings to him as he walked down the street. His brother Jim and his sister Mary ran down the street to hug him. After arriving home, his mother and father cried with joy that their oldest son had returned home. The Navy provided each survivor of Drexler's sinking with a 30-day leave. He did not see Rose on his first day home since he was not in good physical shape, but he enjoyed seeing her many times during his leave. With Joe's mother serving him Italian home cooking every day, he quickly gained 30 pounds. Shortly prior to the announcement of Japan's surrender (within a few days of the war ending), Joe reported for reassignment to active service at the Naval Armory in Chicago. Days later, Joe was reassigned to Navy Pier in Chicago. Then shortly after that, he was reassigned to St. Louis where he worked at the Separation Center at Lambert Field. There he had the chance to attend a couple of baseball games where he could root for his favorite Chicago Cubs against the St. Louis Cardinals. After many months at Lambert Field, he was reassigned to Glenview Naval Air Station in a suburb of Chicago. He had a bus accident while stationed there, so he thought he would receive a reprimand for it when called to see the admiral. However, the admiral surprised Joe with a personal presentation of a Letter of Commendation that was awarded to the men of Drexler for their bravery. Then he was sent to Great Lakes Naval Training Station for discharge in June 1946. Even with his admirable service record aboard Drexler, he never received his final paycheck from the Navy despite repeated inquiries. Although Joe had told his family many times the story of Drexler's sinking and other incidents in the Navy, he never had the chance to tell the history of his naval service from beginning to end until this morning in May 2006. Even though over 60 years had passed, he vividly remembered the details of the sinking. Deep emotions still remain from the traumatic event. While telling his story, he paused and wept a few times such as when he recalled the deaths of his two Italian friends, the salutes by the men of destroyer Lowry to pay respects to Drexler survivors on the LCS, and the warm homecoming greeting by his family. As he talked, he made the sign of the cross several times to show his gratitude to God for allowing him to survive and his remembrance of 158 Drexler shipmates who died in the sinking. Before my wife and I left after the interview, Joe and Rose took us on a tour of their home and backyard. We discovered how interested and actively involved their three children, Andrew, Grace, and Roseann, and their five grandchildren have been in his story of surviving Drexler's sinking. A pencil drawing of Drexler, together with a brief history of the destroyer, hangs proudly in their family room. He told us his son Andrew had an artist draw the ship and gave it as a gift. His daughter Roseann contacted Bath Iron Works in Maine to obtain photos of the destroyer’s construction as well as launch photos for the ship's history published by the U.S.S. 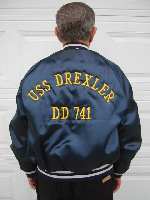 Drexler (DD-741) Survivors Reunion Association. She also arranged to have the American flag flown on December 7, 2001, at the USS Arizona Memorial at Pearl Harbor in honor of her father and Drexler's crew. She even wrote to President Bush in March 2006 to try to get the government to officially honor Drexler's crew, but there has not yet been a response. you wonderful and precious granddad! but always remember you are one-of-a-kind!